Best tradeshow marketing tips and case studies. Call 800-654-6946. Jeffrey D. Brown has re-launched Tradeshow Blues, a website that he’s maintained for years mostly as a labor of love. Tradeshow industry folks have congregated around features such as “Spill the Beans” and the Tradeshow Wall. Jeffrey and I have had a number of conversations over the years and I find him to be a passionate advocate for tradeshow marketing. Definitely picked up some useful tips from him and the site, too. Jeffrey’s on Twitter, so you might give him a follow at http://twitter.com/tradeshowblues. One thing which fascinates me is the Tradeshow Wall, an interesting take on the ‘wall’ concept which seemed to be the rave for a short time back in, what, 2005? But it’s a wall with a twist. Take a look and see what you think! Jeffrey also hosts a guitar wall, a wall for Orange County and the Housing Wall – just launched to help people find homes. The Guitar Wall in particular is a terrific resource for anyone interested in guitars (me!). Lots of links to guitar manufacturers and suppliers. As an exhibitor, how can you get the attention of the media at a tradeshow? After all, media coverage is free and has a lot more credibility than a purchased ad. So it makes sense to have a strategy in place to court the media’s interest and – hopefully – good coverage. What gets the media’s attention? How do you approach the media? What kinds of things do you need in place on your website that will help the media see you in a media-savvy light so they’re more inclined to cover you? We put those questions to Public Relations Director Amber Lindsey with Koopman Ostbo, Inc. in Portland. KO is a Marketing Communications company, focusing on brand development, packaging, public relations, consumer testing and yes, media relations. 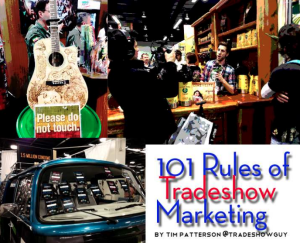 Now that we’ve already had several dozen downloads of the free e-book “101 Rules of Tradeshow Marketing” from all our Tweets it might be time to do an actual, official post announcing the e-book. So here it is. Given that tradeshow marketing is (or can be) a very expensive marketing proposition, and that almost 80% of tradeshow leads go down the drain, I thought it was time to compile a fun crib sheet or ‘cheat sheet’ of Rules of Marketing. Yeah, there are probably more than 101 rules, but it’s such a nice number. To download the book click here or click on the image of the book. And…yes! We’d love to have your comments and feedback! Feel free to tell us what you think. Warwick Merry joins us from Melbourne, Australia – land of Down Under. Warwick has done his fair share of great marketing and shares ideas and tips on how to improve the ROI at your next tradeshow. Is Your Staff Ready? I mean, READY? When you arrive at the tradeshow with a well-trained staff, you communicate a subtle message to visitors and fellow exhibitors: We Came Prepared. We’re Ready for You. Bring It On. It’s all part of your bottom line: a well-trained staff can increase both the quality and quantity of your take-home leads. Team meetings every day can keep your staff focused and on task. A well-trained staff will invite visitors in by smiling and asking pertinent qualifying questions. They’ll determine who’s a quality prospect and who’s not, and effectively move the prospects into the sales funnel and the non-prospects out of the booth. By taking the time to train your staff in engaging and qualifying your visitors, you’re investing in a valuable resource. And that investment will reap dividends in the real world – your tradeshow marketing ROI. Pardon me for being blunt, but that’s no reason to go to a trade show! If you’re looking for some reasons to exhibit, let me give you a dozen. There are certainly a lot more, but let’s try these for starters. A tradeshow is a great marketplace for finding a targeted audience, most of who are PAYING for the privilege of being there. Many are buyers or people who can recommend your product to the right people in their company. Do you have a product that really benefits from a hands-on approach? Or can you show thousands of people a video of the benefits of your product? Once people get their hands on your product, they’ll really understand it. Sometimes this is a very strong reason to attend a tradeshow. A fairly well established company may not plan on gathering new distributors or making too many sales at a show, but they can always strengthen the position of their brand with a good presentation. It also reassures your clientele that you’re still strong in the game. Nothing beats a face to face meeting. With a tradeshow potential buyers will stop by your booth and you’re able to engage them in conversation, learn their problems, offer possible solutions and lock down the next step in the sales process. If you plan it right, you can get a lot of industry media mileage out of your tradeshow appearance. If you’re going this route, the best way to attract the media’s attention is with something new, whether it’s a new product, a new way of approaching an old problem or a new twist on an old product. A good publicist can help you craft the right approach and make sure the right media folks know about it. If you have a strong dealer base, there’s nothing like a tradeshow to plan a training module for any new products, changes or shifts in priorities. This also reinforces your relationship with the dealers and gives them more incentive to help your company succeed on a higher level. I used to think that only certain industries really lent themselves to corporate espionage. Okay, perhaps ‘industry research’ is a better term. Where else can you see most, if not all, of your main competitors in one spot, with all of their latest and hottest products on display? You can use the tradeshow setting as your own laboratory. At the recent Natural Products Expo West, Kettle Foods offered five new possible potato chip flavors to attendees and had them vote on their favorites. Eventually one (or more) of those flavors will end up on a grocery shelf. Depending on the industry, this could be a very effective way to reach potential customers. 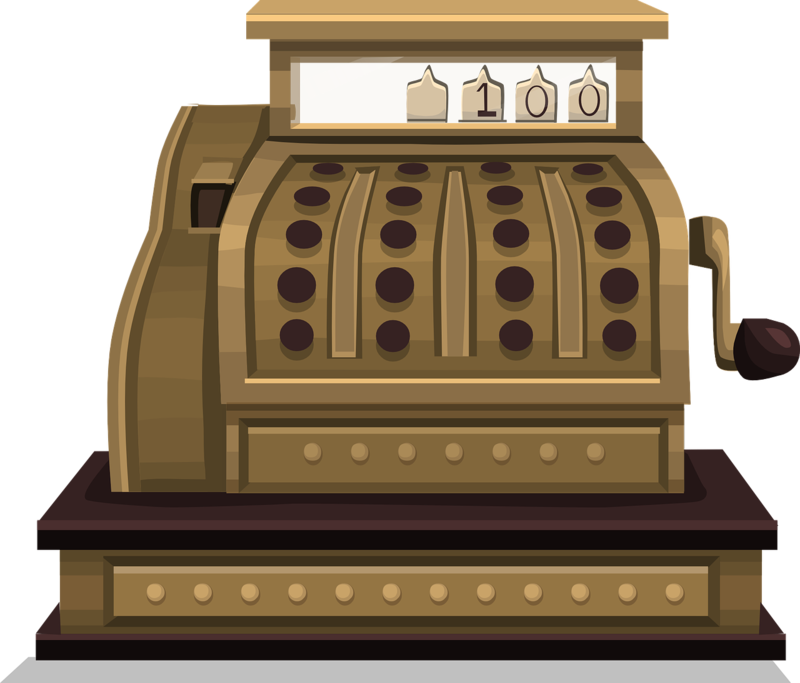 In 2001, the average business-to-business sales call cost $329, according to Cahners Research. The Trade Show Bureau says the cost of an average tradeshow lead is $142. The numbers will vary from company to company, but it’s a sure bet that trade show leads cost you less than a sales call. Not only can you test products, you can uncover information from your prospects. Maybe a short informal survey is just the thing. By offering a token with a high perceived value, you could probably get hundreds of attendees to take five minutes and answer a short questionnaire geared to uncover important information. Tradeshows are successful for a lot of reasons. One reason is that management-types will attend high-profile industry tradeshows. Use this opportunity to target your prospects, invite them to your booth, and take the steps necessary to make sure they show up, by offering premium incentives available only to them. If the space in the exhibit hall is too spendy for you or you’re not able to book a booth space for whatever reason, you can always set up shop in a nearby hotel. Book a suite and set up your products or demos, and invite your targeted prospects. It’s a more relaxed situation where you can serve refreshments, talk more at length and start getting to know the people you’d like to do business with. And they’ll start getting to know you, too! There are dozens of other reasons you can find to exhibit at tradeshows, one of the most cost-effective ways of continually marketing to your target. But these twelve reasons will at least get you started on the right track! Do you count the leads you bring home from a tradeshow? How do you determine what is a lead – exactly? Is it the name and contact information of a person who has expressed interest in your product or service? Is if a business card from someone who dropped it in a fishbowl at your booth because you were giving away a prize? Is it a name on a list of contacts that you know are buying your type of product or service? Gathering the leads from a tradeshow is important. But just as important, perhaps more so, is knowing the quality of those leads. Do your new leads have an interest in what you do? Are they in the market? Do you know what their buying time frame might be? The more information you can glean from your contacts, the better you can categorize those leads. As long as your prospect possesses the criteria that you set they have the essential qualities to eventually become a customer – and they’ve become a lead. How much is your lead worth? If you’re going to a tradeshow to sign up distributors, and you know that in the past your distributors have ordered on average $20,000 worth of goods from you in the first year of being a distributor, and you also know that you have signed up one out of four qualified leads in the past two years – each new lead is worth about $5000 the first year. Let’s look at it from another angle. Say you spend $28,000 exhibiting at two industry shows a year and gather about 350 leads through those shows. Your cost per lead is $80 ($28,000 / 350). If you are able to consistently show that one in four leads converts to a sale, your lead-to-sales conversion rate is $320 ($80 x 4). So now you’re able to put a number on those leads that’s realistic. Let’s say you have a salesperson who can close one out of three qualified leads. His cost per lead is lower, and his lead-to-sales conversion is higher. If you have a salesman who’s not performing as well, his cost per lead is higher. Or, look at is this way. Since your leads are worth on average $5000 the first year, by closing on just one out of five leads, that represents a lost opportunity cost of $5000. Now that you can estimate the value of your leads, it becomes that much more important to make sure you’re following through with your lead generation and capture process at your tradeshows. After all, you’re investing thousands in those leads! Make sure they pay off! What system should you use? Anything that works. It could be an electronic scanning device. It could be a clipboard where you fill out a short bit of information. But to make it workable, it should be quick, convenient and accurate. Before capturing the contact data of the lead, confirm that they’re qualified. This may be as simple as asking a question or two to determine that they’re interested in your product or service, to running through a longer process of Q and A, depending on the complexity of your offering. The first thing when it comes to choosing whose data to capture is to immediately take the attitude of disqualifying everybody. Once a person confirms they are NOT interested in your product, you know you do NOT need to capture their information. At the top of your list are those prospects who are ready to buy. For these you may have a sales person talk to them on the spot. Even if they say they are ready to buy, take a moment or two to run them through the few steps or questions prepared by your sales team to confirm their stance. In between the non-buyers and the hot prospects are the rest – those who are expressing a level of interest, but may not be ready to buy right now. If you’re able to, you should determine the time frame that they might want to purchase. If not, you can at least indicate that on your data capture so the sales person has as much information as possible. The more information you can reasonably gather before the show is over saves time and money on the follow up after the show. Your lead data form can include anywhere from a few pieces of information to 20 or 30 points that you may want to cover. Certainly you’ll want to make sure each lead has basic information such as the employee who captured the data, what show you obtained the data at, the show date, etc. Your contact information would include as much or as little as possible – the more qualified the lead appeared and the more receptive he was to information, the more data you’d want to get from him. But each person should be handled on a case-by-case basis, so that the information is individualized – which is they way they’d probably want to be treated, anyway! The next step, of course, is to hand all of the leads over to your sales group after the show to turn those leads in to revenue as soon as possible. Look at each lead as a source of potential revenue because that’s exactly what it is. Based on your past performance, you can safely determine about how much each lead is really worth. The more you refine and test your lead generation system, and try new things, the higher the value of each lead. You may find as you refine your process of qualifying leads, the actual number of leads may drop – but the potential value of each lead increases. Now that you have determined how important each lead is, what’s your next step? Make sure that your sales group is in immediate follow-up mode once the leads come back. It’s been said that anywhere from 60 to 80% of all tradeshow leads are effectively trash-binned because they’re not properly followed up on. If you can effectively follow up on even half of your qualified leads, you’re going to lead! Function (fungk’sh?n): the action for which a person or thing is particularly fitted or employed. a. Assigned duty or activity. b. A specific occupation or role: in your function as race car driver. Just because your tradeshow booth LOOKS good, ATTRACTS people and WOWS the judges at the show, doesn’t mean you had a successful show. There are other elements, such as: did you bring home more leads than you anticipated? Are you following up on those leads? Did your staff learn something good and useful for next show? And perhaps most importantly: did your booth FUNCTION as it should have? To determine if your booth is designed with more than just pretty graphics and a ‘wow’ factor to draw in the rubes (er, uh, show attendees), your designer should ask a lot of pertinent questions about the function of your booth. Function is getting down to the bottom line. If you need to sit down with clients or prospects and go over a product line or discuss aspects of business, you’ll need a place to do that. That’ll likely mean a small table that 3 or 4 people can sit down and chat at least a few feet away from the main traffic of the show. If your business needs to let prospective customers get their hands on a computer mouse and play with the software to see how it applies to their business, you’ll need to make sure there’s room (and power) for the computer. Or perhaps your booth needs room for a demo that can accommodate a dozen or more people. That space and accommodations need to be worked into the design. It may seem like a no-brainer, but it’s still an important consideration. Many folks purchase a small booth display and go to great lengths and expense to make it look good. But if there’s a vital element missing that impairs your overall function, the time to discover that is not on the show floor! Go over your show objectives as you sit down with your designer. If they’re sharp (as we hope all designers are, right? ), they’ll make sure that your booth’s design incorporates all the essential functions that your booth will need to serve. And with such a collaborative effort between your tradeshow team and your booth design team you will ensure that all of the booth’s function needs have been met. 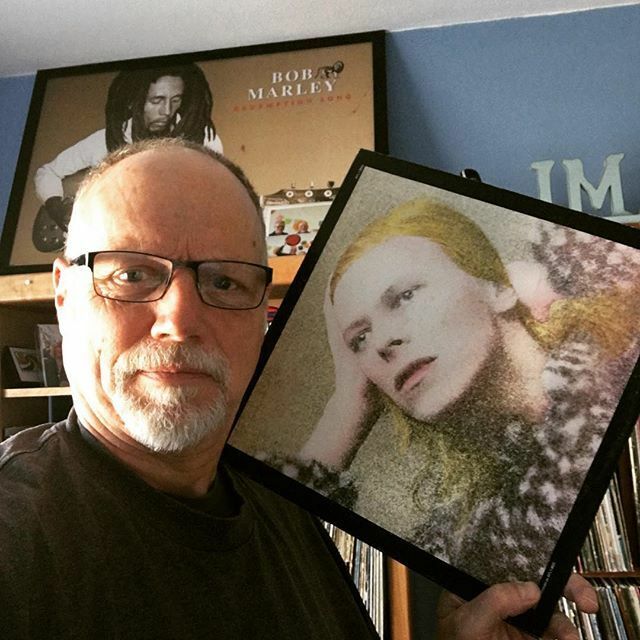 Tim Patterson is the VP of Sales and Marketing at Interpretive Exhibits in Salem, Oregon. Contact us at Interpretive Exhibits, Inc. if you would like to find out more details: info(at)interpexhibits.com or 503-371-9411. Are you considering a custom tradeshow exhibit? There are a number of reasons to strongly consider a custom tradeshow exhibit vs. a modular or manufactured exhibit. First, a custom tradeshow exhibit means that your company will have a unique, one-of-a-kind presentation. No one else will look like you. You’ll stand out in a crowd! Second, a custom booth can be designed and fabricated from the outset to accomodate a variety of needs and intended usages. For instance, if you have an exhibition schedule that demands you exhibit in a 10′ x 20′ space in one show, and a 20′ x 20′ space in another show, and a 10′ x 10′ space in yet another show, the components of the custom tradeshow exhibit can be easily designed to accomodate those needs. Next, your design team is really starting with a blank slate. A good tradeshow designer will start by asking questions – a lot of questions! So many in fact, that you’ll probably wish they would stop! Actually, it’s all good – it means they care about creating the booth that you really want. One that works for your company from many angles: the ‘look and feel,’ the functionality and the branding. Finally, a custom tradeshow exhibit will give you those intangibles: pride of ownership, unique corporate identity and a feeling that really can’t be beat! What about pricing? Since your budget is perhaps the most critical issue with your new booth, let’s address it: in almost all cases, you can purchase an ‘off-the-shelf’ tradeshow booth that will cost less than a custom booth. But that doesn’t mean your custom tradeshow exhibit has to cost an arm and a leg. In fact, at Interpretive Exhibits, we pride ourselves on offering custom prices for tradeshow design and fabrication that is typically under the industry averages. We’re able to do that because the cost of living in Salem, Oregon is not as high as a major metropolitan metro area, which means our overhead is noticeably lower. Are you ready for the next step? If you are seriously considering a custom tradeshow exhibit, give us a call at 503-371-9411 and talk to one of our designers or account representatives to find out how we may help you. Of course there are other considerations, such as graphic design and production, time schedule, shipping logistics, and more. But in a nutshell that’s the process. Are you doing a little tradeshow planning? Are you going as an exhibitor, or just a tradeshow attendee? If you’re not going to exhibit, you may think that you don’t really need a concise plan, except for a few exhibitors to visit and some conferences to attend. But look at this again: as a conference attendee in your industry, you have so much more you can come back with. For instance, you might do a little spying! Yup, make a list of your main competitors and see how many are exhibiting. Then make a point to stop by each booth, and perhaps even chat up some of the booth attendees on their new offerings. Now, any well-trained booth staffer will know what he can and can’t talk about, but that doesn’t mean your competitors have trained their staff well. (Have yours?) Just by asking a few innocent questions, you might uncover information on an upcoming product or service they’ll be offering soon that your company wants to know about. The tradeshow is also a great time to meet partners and reinforce alliances. Everybody’s time will likely be heavily scheduled, so plan your specific meetings well in advance. If you wait until the week before, chances are good that the person you want to have dinner with on Saturday night is completely booked up. Next, walk the show floor with an eye to what exhibits stand out. Are there any new exhibit properties or accessories that catch your eye? Are your competitors setting up booths with new cutting edge materials, or are they using the same old exhibits from 1996? Just note what types of things catch your eye and draw your attention. Is it a ceiling banner? Is it an eye-popping graphic? Is it an unusual demonstration? Collect these good ideas and you’ll be able to consider them for your own exhibit in the future. During all of this ‘work,’ make sure you plan a little R-n-R for yourself. After all, chances are that you’re in a big city that offers entertainment you may not have in your town. Plan at least one night out with co-workers or industry colleagues if you can. Dinners are always great, especially if you heading for an unusual restaurant (I vividly recall the dinner with clients at the Japanese restaurant I had last year!) – it will usually afford you plenty of time to get to know each other better in far different circumstances that you haven’t experienced before. No doubt you’ll have a good handle on the little things, such as comfortable shoes (you’ll be on your feet a LOT) and clothes, lots of business cards to hand out, show planning schedule, small first aid kit, etc. But nothing like a good reminder. So get on out there and have a great time at the show! 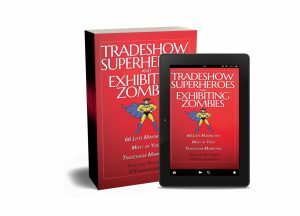 Get My New Book: Tradeshow Superheroes and Exhibiting Zombies! Never tried a meal kit. Why? My wife is a damn good cook. And I can make a fine sandwich!